For the Bosnian-Herzegovinian actor, see Tahir Nikšić. Nikšić (Serbian Cyrillic: Никшић, pronounced [nîkʃit͡ɕ]) is the second largest city of Montenegro, with a total population of 56,970 located in the west of the country, in the centre of the spacious Nikšić field at the foot of Trebjesa Hill. It is the center of Nikšić Municipality with population of 72,443 according to 2011 census, which is the largest municipality by area and second most inhabited after Podgorica. 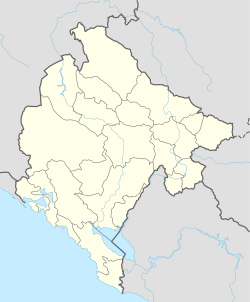 It was also largest municipality by area in former Yugoslavia. It is an important industrial, cultural, and educational center. The Romans built a military camp (castrum Anderba) in the 4th century AD, which was known as Ostrogothic fortress Anagastum (after 459. AD) possibly on an earlier Illyrian tribal settlement. Slavs settled in the area in the 6th and 7th century. The Roman name was transformed into Slavic Onogošt, which was the name of the town and župa (county) throughout the Middle Ages. During the Early Middle Ages, it was located within the South Slavic (Sklavenoi) tribal provinces of Travunia or Duklja (which were under the authority of the Serbian Principality of the Vlastimirović dynasty). With the fall of the Vlastimirovići and the hinterland regions in the second half of the 10th century, Serbia was resurrected with Stefan Vojislav and his Vojislavljević dynasty, succeeded by Stefan Nemanja and his Nemanjić dynasty, at which time the Onogošt župa existed. With the fall of the Serbian Empire, Onogošt came under the rule of Kingdom of Bosnia in 1373, and was under the rule of the Kosača noble family, which held territory in Herzegovina from 1448 until Herzegovina fell to the Ottomans. Carev Most was designed by Nikšić's city planner Josip Slade and completed in 1894. Nikšić was officially recognized as a part of the Principality of Montenegro in the Treaty of Berlin. The small Ottoman hamlet began to transform into a modern urban settlement. The first urban plan was adopted in 1883, commissioned by King Nikola, who appointed Croatian architect Josip Slade to develop the city planning. In addition to designing contemporary Nikšić, he also designed the monumental Carev Most nearby. The ousting of King Nikola and the context of the transition to the Kingdom of Serbs, Croats, and Slovenes resulted in considerable tension and even violence in Nikšić. On December 23, 1918, Nikšić was the site of a skirmish between Montenegrin Greens and Serbian troops under the command of Dragan Milutinović. The Greens had launched an attack on Nikšić during the Christmas Uprising, although Serbian forces prevailed. Even after the Christmas Uprising ended, some Montenegrin Greens continued a resistance against the Yugoslav government for many years. On December 28, 1923, 11 Montenegrin "Komiti" who continued guerilla activities after the Christmas Uprising were executed in Nikšić by the Serbian Gendarmery. Nikšić saw the establishment of rail transport during the Kingdom of Yugoslavia. On July 12, 1938, after thirteen years of on-and-off construction, the first train arrived from Bileća at the newly constructed railway station in Nikšić. A gate was decorated in front of the new station, on which a portrait of King Petar II was installed with "Long Live Yugoslavia!" written under the portrait. Approximately 5,000 people waited for the first train to ever arrive in Nikšić, even when its arrival was delayed by two hours on a hot day. During the delay, much of the public was reportedly impatient, with two war veterans leading a kolo dance on the railroad tracks before the train arrived. During World War II, Nikšić was first occupied by the Italian governorate in Montenegro. The occupation resulted in several insurrections, with one of the earliest started by the Yugoslav Partisans. The first Partisan advances were violently repressed, as Nikšić became the site of a large number of public executions, including those of notable communists Ljubo Čupić and 16-year old Joka Baletić. Over the course of April 7-8, 1944, Nikšić was bombed by the Royal Air Force, using Vickers Wellington long-range bombers. One of the Yugoslav Partisans' commanders in Montenegro, Peko Dapčević, requested to Josip Broz Tito that allied forces bomb Nikšić in order to force out the Nazi occupation. The recorded number of casualties from the bombing raid vary depending on different sources, ranging from approximately 200 to 500 killed. After the end of World War II, Nikšić became the site of unprecedented industrial and political developments. On September 24, 1948, six unmarked Supermarine Spitfire aircraft landed at Nikšić's Kapino Polje Airport, where they were retrofitted and delivered to the Israeli Air Force in a secret operation. During the operation, the airport was quarantined from the public by Yugoslavia's State Security Administation. The unmarked aircraft were flown by pilots from the Israeli Air Force, and three of them were used in the 1948 Arab–Israeli War less than a month after delivery. One of the biggest changes in Nikšić were the construction of new factories, particularly the metal processing plant "Boris Kidrič", which Josip Broz Tito first visited in May 1959. Tito visited the Boris Kidrič plant again on May 12, 1969, after it was reported that the plant recorded a positive net revenue for the previous quarter-year for the first time since its establishment. During his second visit of Nikšić, Tito insisted that negative business results be addressed by modernizing machinery in the factory, as opposed to placing responsibility solely on workers. By 1985, the Boris Kidrič metal works employed over 6,500 workers, although that year two strikes took place. Chronic inflation of the Yugoslav dinar had already began, and the metal works were dependent on imports in order to produce. This added pressure to raise prices of steel products, which in turn made them less competitive with steel from western Europe. The city population was increased tenfold, and Nikšić became the heart of Montenegrin industrial complex. During the socialist republic era, the city flourished, as steel and iron works, bauxite mines, electricity production, brewery and wood processing industries were set up in and around the city. With the breakup of Yugoslavia, Nikšić was hit hard with the hyperinflation of the Yugoslav dinar, international sanctions, and overall decline throughout Yugoslavia during the 1990s. Nikšić had a large amount of reservists in the Yugoslav People's Army. Between 62 and 77 JNA soldiers killed in the Yugoslav Wars were from Nikšić alone. Political tension in Nikšić was polarized between Serbian nationalist and Montenegrin secessionist groups. Although Nikšić did not experience violence from the war in neighboring Bosnia, there were some extraordinary incidents. In the fall of 1992, Vojislav Šešelj planned to hold Serbian Radical Party rally in Nikšić. However, a well-known local named Brano Mićunović plotted to assassinate Šešelj outside of a tunnel upon entering Nikšić, and Šešelj ultimately cancelled the meeting after hearing about the plot. In June 1993, Hadži-Ismail's mosque was destroyed during unrest. Years of wartime tension and widespread poverty took a toll on the city. In 1996, Nikšić recorded the second-most amount of suicides out of any city in Yugoslavia. After a period of twenty days during which six suicides and two murders took place, clergymen in Nikšić decided to start an annual public liturgy, or Litija, which was attended by tens of thousands of worshipers who walked all the way from the Ostrog Monastery in May 1996. Nikšić is situated in north-central Montenegro. It is located at the centre of the spacious Nikšić field (Nikšićko polje), a karst plain with an area of 48 km², and an elevation of 640 m AMSL. The plain is surrounded by inhospitable rocky mountainous terrain, a typical landscape of western Montenegro. The city itself is located at the foot of the Trebjesa hill. Zeta river originates in the Nikšić field, and flows near the city of Nikšić, before it becomes a subterranean river south of the city. The river caused frequent flooding of the plain, until the construction of Hydroelectric power plant Perućica in 1960. The construction of the power plant resulted in creation of three large artificial lakes near the city - Krupac Lake, Slano Lake and Vrtac Lake. Today, the lakes are a popular recreation and relaxation retreats for the citizens of Nikšić. Under the Köppen climate classification, Nikšić has an oceanic climate (Cfb), which is influenced by the Mediterranean climate drying trend during summer. The average temperature in January is 1.7 °C (35.1 °F), while in July its is 20.4 °C (68.7 °F). Average humidity amounts to 69%. Nikšić receives 2,238 hours of sunshine per year, with warm and moderately wet summers, and cool and rainy winters. On average, there are 19 days per year with snowfall. Although Nikšić area has seen human settlements since antiquity, most of the modern Nikšić is a planned city. Very little remains of the Ottoman architectural heritage, despite the long presence of Ottoman Empire in the area. The city layout visible today still follows the 1883 urban plan commissioned by King Nicholas and designed by Croatian architect Josip Slade. According to this plan, the streets of Nikšić radiate to the north and east from the central city square (today a roundabout), locally known as Skver. The radial streets are intersected by circumferential streets and avenues, thus creating a half-spider web-like street layout. Layers of different architectural styles and urban patterns are evident along the radial network of streets. Thus, closest to the central roundabout is the historical core of Nikšić, formed after the liberation from Ottoman Empire, and serving as a nucleus for Slade's urban plan. This area, on the foot of Trebjesa Hill, is home to King Nicholas Palace, City Park, and Freedom Square, main city square located along the central Njegoševa Street. The area is composed of mostly single or two storey row housing with basic designs, an architecture typical for late 19th and early 20th centuries Montenegro. The roundabout and the surrounding area is still the focal point of activities in the city, as bus and train stations, as well as commercial and civic services are located in the area. Farther from the central roundabout, the historical core is encircled with a layer of mass residential blocks, built during the SFRY era. The building of the highrise residential blocks facilitated housing of the large population drawn to the city by rapid post-World War II industrialisation. The SFRY era apartment blocks are still home for the majority of residents of Nikšić. Beyond the blocks, the city expanded in form of a suburban sprawl, that consists of detached housing. Close to the city blocks and major industrial areas, the lowrise single home suburbs are built with well executed urban plans, but farther away from the center, the city expanded in a chaotic and informal way. In addition, the rural areas south of Nikšić have merged with the city, so low density suburbs extend from the city in every direction, covering much of the Nikšić Field. Zavičajni Muzej (County Museum), situated in the former royal Palace of King Nikola, documents the historical development of the city. The most significant cultural event in the city is Septembarski Dani Kulture (September days of Culture), that is one of the most recognizable cultural happenings in Montenegro. Other annual artistic events include Pjesnik na korzu (Poet on the promenade), Međunarodni festival glumca (International actors festival), Međunarodni festival kamerne muzike (International festival of chamber music), Međunarodni festival gitare (International guitar festival). Lake Fest rock festival, held annually at Krupac lake and Bedem Fest rock festival, held at Bedem Castle are gaining ground as one of the most recognizable music festivals in the former Yugoslav region. Nikšić is known for its distinctive cultural atmosphere and bohemian art scene, with poet Vitomir Nikolić and singers/songwriters like Miladin Šobić or Marinko Pavićević as prominent representatives of the Nikšić bohemian spirit. Živko Nikolić, a native of Nikšić, is considered the most significant Montenegrin movie director. Media scene of Nikšić is mostly confined to public broadcasters TV Nikšić and Radio Nišić, and a number of commercial radio stations. Riječ and Luča magazines, published by Faculty of Philosophy, as well as Poznanstva children magazine, are also a part of Nikšić cultural scene. Nikšić is home to 40 educational institutions. Among those are 11 nurseries, 25 elementary schools of which one is elementary music school and 4 high schools, including the Stojan Cerović Gymnasium. Nikšić is regarded as one of the centers of Montenegrin sport. The combat sports are particularly popular in Nikšić, with a strong tradition in judo, karate and boxing. Nikšić judokas have been exceptionally successful at international competitions. Sutjeska football club is the pillar of the city soccer tradition. The club has risen to the Yugoslav First League during the SFRY era, and is one of the most successful clubs since the Montenegrin First League was established in 2006. City Stadium is the clubs home field. Čelik football club is also becoming more prominent as it has reached the UEFA Europa League qualifying phase. In basketball, not only has Nikšić produced great players (Bojan Dubljevic or Ana Pocek for example), but the local team KK Sutjeska Nikšić became champions of the Montenegrin Basketball Cup in 2013. Other team sports, particularly handball and volleyball, are also popular in Nikšić. Besides City Stadium, other significant sporting venue is the Nikšić Sports Center. This facility features a 3,000 seat indoor sports hall, olympic-size swimming pool, 6-lane bowling alley, sports shooting range, tennis and futsal courts, and various other facilities. Vučje ski resort is 18 km away from the city center, making winter sports a popular recreation among the citizens of Nikšić. Nikšić is administrative centre of Nikšić Municipality, which incorporates a densely populated fertile plain called "Župa", and has a population of 72,443 (2003. census). Nikšić itself has 56,970 citizens. Nikšić Municipality can be viewed as a metropolitan area of the city of Nikšić. Nikšić is, alongside Podgorica, one of the biggest industrial centres of Montenegro. A Steel mill (Nikšićka Željezara), bauxite mine, Trebjesa brewery (Nikšićka Pivara), and many more are concentrated in this city. These big industries had struggled to survive the collapse of the socialist economy, but have since recovered. The process of privatization is either finished or still in progress for some of these industries. Today those industry giants cannot employ as many workers as they could back in the days of Socialist Federal Republic of Yugoslavia, and the economy of Nikšić is slowly transforming into one that is more service-oriented. In 1981 Niksic's GDP per capita was 91% of the Yugoslav average. Nikšić's main road connection is E762 highway, which connects Nikšić with Podgorica to the southeast, and with Plužine and on to the Foča and Sarajevo (Bosnia and Hercegovina) to the northwest. Another recently reconstructed north/south Montenegrin road corridor passes through Nikšić, the Risan/Trebinje-Nikšić-Šavnik-Žabljak road. This road is the shortest connection Nikšić has with Bay of Kotor and Montenegrin coast. Nikšić also has the distinction of being one of the first Montenegrin towns to have a bypass road. The bypass, built during the SFRY era, has been upgraded in 2011, and now services every transit corridor of Nikšić, directing all transit traffic away from the urban core. Like many cities in the former Yugoslavia, Nikšić is the hub of multiple intercity bus companies, the largest of them being Glušica Nikšić and 4 Decembar Nikšić which operate to destinations as far as Sarajevo and Belgrade. Nikšić is the terminus of Nikšić-Podgorica railway, which is sole rail connection of the city. This railway line connects with Belgrade-Bar and Podgorica–Shkodër lines in Podgorica. This rail link has been used mainly to transport bauxite from Nikšić bauxite mine to Podgorica Aluminium Plant. It is currently under reconstruction and electrification, and passenger service will be reintroduced once the reconstruction is completed. Three CAF Civity EMUs have been ordered by Railways of Montenegro specifically to serve this railway, cutting the travel time between Nikšić and Podgorica to only 50 minutes. The first of the new trains will go into service on June 1, 2013. Nikšić obtained its narrow-gauge (760 mm (2 ft 5 15⁄16 in)) railway connection with Bosnia and Herzegovina via Bileća and Trebinje when the railway line was extended from Bileća and opened in 1938. Not far from Trebinje, the narrow-gauge line used to branch off in three directions: towards Čapljina in Bosnia and Herzegovina, Zelenika in Bay of Kotor in Montenegro (a dead end), and Dubrovnik in Croatia (also a dead end). After reaching Čapljina, the line used to run to the south, to the Ploče harbour in Croatia, and to the north, to the rest of the world via Mostar and Sarajevo. The narrow-gauge extension from Nikšić to Titograd (Podgorica), built by youth work brigades, was opened in 1948. That extension was converted to standard gauge (1,435 mm (4 ft 8 1⁄2 in)) in 1965. The narrow-gauge line from Nikšić to Čapljina was closed down in 1976 and dismantled soon after. Nikšić Airport is located on the western outskirts of the city. It is a small sport airport, that caters to needs of general aviation, and of local enthusiast aviation club. After significant reconstruction and expansion, the airport was chosen to be a host of 2010 FAI World Parachuting Championships. Scheduled passenger service has yet to be introduced. Podgorica Airport is some 60 km (37 mi) away from Nikšić, and has regular flights to Belgrade, Sarajevo, Budapest, Zürich, Frankfurt, Ljubljana, Paris, Rome and Vienna. Both Tivat and Dubrovnik airports are some 100 km (62 mi) away, and offer regular services to major European destinations. ^ a b "Montenegrin 2011 census". Monstat. 2011. ^ "O NIKŠIĆU". Mladi Nikšića (in Serbian). ^ Slobodan Drobnjak Sait Š. Šabotić (February 11, 2017). "„KULTURNE PRILIKE I KULTURNI STVARAOCI NIKŠIĆA IZ OSMANSKOG PERIODA"". Sandžačka književnost (in Serbian). Retrieved December 28, 2018. ^ a b c d e f Boško Roganović (November 12, 2016). "Nikšić kroz istoriju: Džamije". Onogošt (in Serbian). Retrieved December 28, 2018. ^ a b Danica-Kaća Čolović (January 8, 2016). "Svaki drevni grad je posebna priča". Novine Nikšića (in Serbian). Retrieved December 28, 2018. ^ a b Boško Roganović (April 24, 2016). "Nikšić kroz istoriju: Izgradnja nove varoši". Onogošt (in Serbian). Retrieved December 28, 2018. ^ Živko Andrijašević. Istorija Crne Gore. (in Serbian) July 2015. p. 261. ^ Vladimir Jovanović (January 16, 2017). "Dvije komitske sudbine". Otvoreni Kulturni Forum (in Serbian). Retrieved December 29, 2018. ^ a b c d Boško Roganović (March 10, 2014). "„Ćiro" je stigao u Nikšić". Novine Nikšića (in Serbian). Retrieved December 29, 2018. ^ a b Rade Radovanović (May 9, 2014). "Danas: Ljubav je jača od svakog rata i svakog zla" (in Serbian). Retrieved August 11, 2017. ^ a b c Ivan Miladinović (January 13, 2015). "Novosti: Peko traži da se gađa Nikšić" (in Serbian). Retrieved August 11, 2017. ^ a b c Siniša Luković. "Kad je Nikšić bio Alabama". Vijesti. Archived from the original (via Wayback Machine) on 1 October 2018. ^ a b "Retrospektiva: Tako je Tito govorio o Željezari „Boris Kidrič"". Onogošt (in Serbian). May 20, 2016. Retrieved December 29, 2018. ^ a b "Željezara "Boris Kidrič" Nikšić: Gigant čije ime među metalcima u svijetu izgovara s poštovanjem". Yugopapir (in Serbian). May 1985. Retrieved December 29, 2018. ^ Svetlana Mandić. "U Nikšiću obilježeno 18. godina od NATO bombardovanja". Vijesti. Archived from the original (via Wayback Machine) on 27 March 2017. ^ Veliša Kadić (February 12, 2018). "DIPLOMATSKI SKANDAL U CRNOJ GORI: Sramno prema žrtvama". Večernje novosti (in Serbian). Retrieved December 29, 2018. ^ Vladimir Jovanović (March 5, 2010). "Брано Мићуновић „сувласник" Црне Горе". Nova srpska politička misao (in Serbian). Retrieved December 29, 2018. ^ "Šešelj za Nedeljnik: Jovica Stanišić mi je spasio život, Brano Mićunović je spremao atentat na mene". Nedeljnik (in Serbian). January 18, 2017. Retrieved December 29, 2018. ^ a b Veliša Kadić (May 11, 2011). "Litija duga kilometrima". Večernje novosti (in Serbian). Retrieved December 29, 2018. ^ "niksic". travelsradiate: travelsradiate.com. Retrieved 2010-11-19. ^ "Climate: Nikšić". Hydrological and Meteorological Service of Montenegro. Retrieved May 28, 2018. ^ ZCG Prevoz - Novosti - U julu 2013. godine, isporuka 3 nova EMV-a Archived 2013-03-06 at the Wayback Machine Retrieved November 2011. ^ "ZCG Prevoz - Nikšić - Titograd (Podgorica)" (PDF). zcg-prevoz.me (in Montenegrin). Retrieved 12 April 2017. Wikimedia Commons has media related to Nikšić.